Start off your visit on the 30th (Tue): view the masterpieces at Arlpwe Art & Culture Centre. For traveler tips, where to stay, photos, and other tourist information, you can read our Ali-Curung holiday maker app . Sydney to Ali-Curung is an approximately 33-hour car ride. You can also fly. On the 30th (Tue), you'll have the morning to explore before heading off to Tennant Creek. Tennant Creek is a town located in the Northern Territory of Australia. 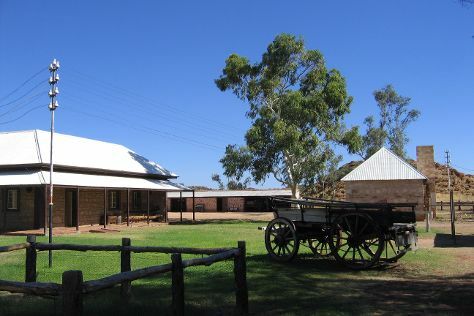 Kick off your visit on the 1st (Wed): explore and take pictures at Kelly's Ranch, don't miss a visit to Tennant Creek Telegraph Station, and then explore the activities along Lake Mary Ann. To see other places to visit, ratings, traveler tips, and other tourist information, you can read our Tennant Creek attractions planner . Drive from Ali-Curung to Tennant Creek in 2.5 hours. In April, plan for daily highs up to 38°C, and evening lows to 24°C. Finish your sightseeing early on the 1st (Wed) to allow enough time to travel to Alice Springs. Start off your visit on the 2nd (Thu): take in the local highlights with Walking tours, contemplate the long history of Alice Springs Telegraph Station Historical Reserve, then get great views at Anzac Hill, and finally take in the exciting artwork at Talapi. On the next day, get engrossed in the history at Alice Springs School of the Air Visitor Centre, then look for all kinds of wild species at The Kangaroo Sanctuary, and then identify plant and animal life at Alice Springs Desert Park. For ratings, maps, more things to do, and more tourist information, go to the Alice Springs attractions planner. Traveling by car from Tennant Creek to Alice Springs takes 5.5 hours. Alternatively, you can fly. Traveling from Tennant Creek in May, things will get slightly colder in Alice Springs: highs are around 28°C and lows about 9°C. Wrap up your sightseeing on the 3rd (Fri) early enough to travel back home.